Madison College pitcher Casey Doucette pitches against the UW-Madison Club Team on April 17. The WolfPack posted a 7-1 victory. The Madison College baseball team has won six of its last eight games, continuing the strong play it has displayed all season. As of April 23, the team’s overall record stands at 26-0 and 9-1 in conference play. In its most recent stretch of games, the WolfPack defeated the UW-Madison Club Team and swept Milwaukee Area Technical College in a doubleheader. The Madison College softball team, though, has lost six straight games to see its overall record fall to 12-21. On April 17, four Madison College pitchers combined to limit the UW-Madison Club team to one hit as the WolfPack won 7-1. Casey Doucette picked up the win for Madison College, with support from fellow pitchers Mac Wichmann, Brent Mueller and Gunnar Neal. Vincent Schmitz, Taylor Carlson and Treysen Vavra each had two hits in the game to lead the WolfPack on offense. Schmitz hit a triple in the game, while Vavra added a double. The WolfPack dropped a game to Heartland Community College, 11-4, on April 19 and split a doubleheader with Oakton Community College on April 20, losing 7-5, then winning 13-6. On April 21, the WolfPack baseball team defeated Milwaukee Area Technical College in both games of a doubleheader, 13-4 and 3-2. In the first game against Milwaukee, the WolfPack jumped out to a commanding lead early. They took advantage of five walks and a hit batter in the inning to score eight runs on just four hits in the first inning. Bryce Barsness had a strong game offensively for the WolfPack, getting three hits, scoring three times and driving in three runs. The second game against Milwaukee was much closer, with Madison College winning, 3-2, on a walk-off RBI single by Ryan McShane. Josh Rowles had two hits in the game for the WolfPack and scored all three runs for his team. On April 22, Madison College dominated the first game against Rock Valley College, winning 12-1, before posting a close 4-2 victory in the second game. In the first game, Madison College benefited from seven walks and four errors by Rock Valley College. Eric DuCharme and Landon Tenhagen both had two hits for the WolfPack in the game. 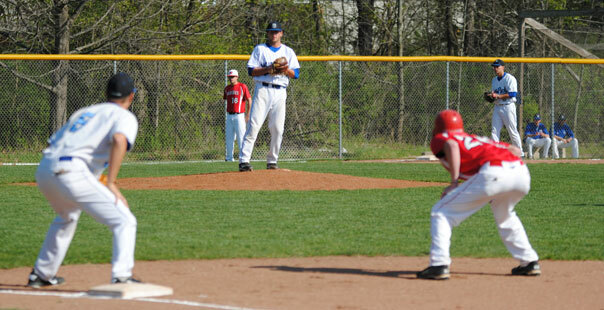 In the second game, pitcher Casey Doucette held Rock Valley College to two runs on nine hits in six innings. Brent Mueller and Cody Peterson pitched the final inning to secure the victory. Vincent Schmitz had a big game for the WolfPack, with three hits and two RBIs. The Madison College softball team was unable to score a run in two games against the College of DuPage on April 21, losing both games, 8-0. The WolfPack had five hits in the first game, but left all of the runners stranded on base. Similarly, the second game saw Madison College limited to four hits, with six runners left on base. On April 22, the WolfPack softball team led both games against Waubonsee Community College before falling, 3-2 and 10-6. In the first game, Waubonsee scored twice in the bottom of the seventh inning to steal a game from Madison College. Heather Edgren led the WolfPack with two hits and two RBIs in the game. In the second game, Madison College scored four times in the fourth inning to take a 6-4 lead. But Waubonsee retook the lead by scoring one run in the fourth inning, two in the fifth and three in the sixth.